This announcement in the trade journal Variety in 1968 marked the arrival of a key innovator in experimental filmmaking. Inspired equally by Hitchcock and Sirk as by Markopoulos and Warhol, Warren Sonbert (1947-1995) had his first career retrospective before his 21st birthday. By the time of his death from HIV/AIDS, he had made eighteen films, the last completed posthumously according to his instructions. DIM Cinema presents a quartet of dazzling films by this seminal figure of the American avant-garde, beginning with a tradition-flouting student film from the mid-1960s, starring two superstars of Warhol’s Factory, and followed by three powerful examples of his mature non-narrative style of “polyvalent montage”— an exuberant rapid-fire editing technique that considers the directional pulls of heterogeneous shots, and combines them along “potentially many dimensions”, to create a distinctive form of lyric cinema. 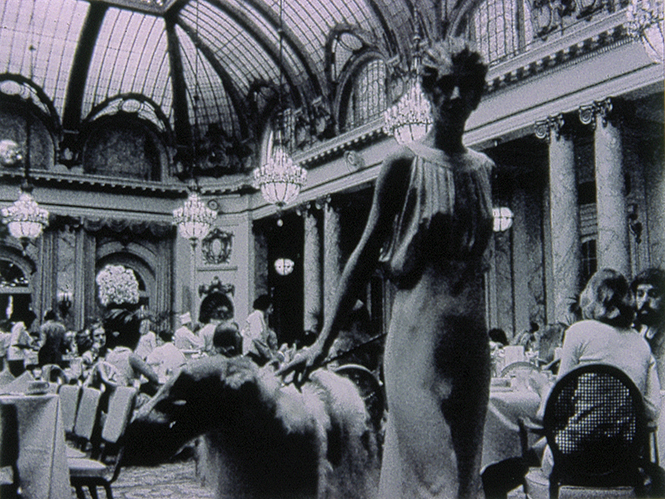 Hall of Mirrors | USA 1966, 16mm, colour/b&w, 7 min. Rude Awakening | USA 1976, 16mm, colour/b&w, silent, 36 min. The Cup and the Lip | USA 1986, 16mm, colour, silent, 20 min. Friendly Witness | USA 1989, 16 mm, colour/b&w, 22 min. Image: Friendly Witness, 1989. Courtesy of Light Cone.